Analysis: At Wednesday's funeral, Bushian optimism upstaged Trumpian cynicism. WASHINGTON — The contrasts drawn between the late President George H.W. 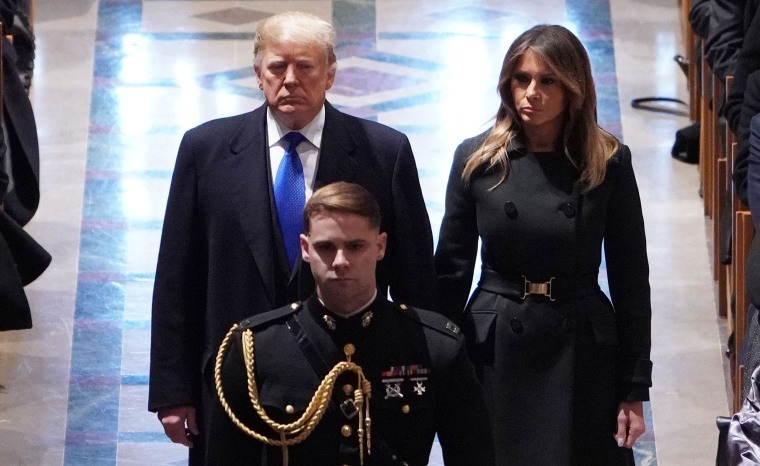 Bush and President Donald Trump were subtle but persistent as the former was eulogized beneath the intricate stained-glass windows and soaring limestone arches of Washington's National Cathedral here Wednesday. The Bush family had made it clear: There would be no politics on display during the day's proceedings — no direct criticism of the man who currently occupied the Oval Office. But public praise for the late president seemed to highlight the areas where he differed from the current commander in chief. Bush was described a loyalist (Trump calls former friends "horse face" and "weak"); as a leader who worked with Democrats on budget deals and the Americans With Disabilities Act (Trump has governed on partisan terms and mocked a disabled reporter); as a president who rallied the world behind democratic values (Trump has spurned U.S. allies and enabled despots); and as a man who dedicated himself to a life of service (in life, Trump has unapologetically served his own interests first). But the theme that seemed to encapsulate their differences most, as Trump sat stone-faced in the front pew of the church amid four former presidents and their wives, was Bush's eternal optimism about humanity. "Abraham Lincoln's 'better angels of our nature' and George H.W. Bush's 'thousand points of light' are companion verses in America's national hymn," historian Jon Meacham said in delivering the first tribute of the day. "For Lincoln and Bush both called on us to choose the right over the convenient, to hope rather than to fear, and to heed not our worst impulses, but our best instincts." In his inaugural address in 1989, George H.W. Bush spoke of the spirit of the American people and called on them to unite their talents, their energy and their fortunes to lift each other up. "I have spoken of a Thousand Points of Light, of all the community organizations that are spread like stars throughout the nation, doing good," Bush said. "The old ideas are new again because they're not old, they are timeless: duty, sacrifice, commitment, and a patriotism that finds its expression in taking part and pitching in." When Trump accepted the Republican nomination for president in 2016, he told the American people, "I alone can fix it." In his own inaugural address the following year, Trump described a bloody national landscape, vowing to end "this American carnage." Trump has appealed to the fear of outsiders — immigrants from south of the border and travelers from Muslim-majority countries — to rally his political base. And in openly saying that he would not be willing to risk the U.S. relationship with Saudi Arabia to come down on Crown Prince Mohammad bin Salman over the murder of Washington Post journalist Jamal Khashoggi, he has made clear his preference for hard pragmatism over the value of ideals in American foreign policy. On Wednesday, Bush's eldest son ascended to address the roughy 3,000 people assembled to say farewell to the man Meacham called the "last great soldier-statesman." Former President George W. Bush described a father whose worldview was formed by early brushes with death — an illness and when his plane was shot down during World War II — giving him the ability to "cherish the gift of life" and "live every day to the fullest." The younger Bush, who would later choke up as he wrapped up his remarks, said his father taught him and his siblings that anything was possible. "The horizons he saw were bright and hopeful," Bush said. "He was a genuinely optimistic man." And in a related note, he said this of his father: "Dad could relate to people from all walks of life. He was an empathetic man. He valued character over pedigree. And he was no cynic. He looked for the good in each person and he usually found it." A few feet away sat Trump, who has an uncanny ability to find the weakness in others and often displays an uncommon urgency to exploit it. He gives his political foes disparaging nicknames — from "low energy" Jeb Bush (the son and brother of the presidents) to "Little Marco" Rubio for the Republican senator from Florida and "Pocahontas" for Sen. Elizabeth Warren, the Massachusetts Democrat he has lampooned for claiming Native American heritage. In contrast to the striking, sunny empathy of the 41st president that drew praise Wednesday, Trump biographer Michael D'Antonio has described the current president's equally notable talent for casting and cementing a positive image of himself and negative messages on others. "This may not be the kind of intelligence we can all admire," D'Antonio wrote. "In fact, it is a cynical, abusive and, some might say, evil form of brilliance." If Bush valued character over pedigree, Trump seems to prioritize them in the reverse. And he is obsessed with his own celebrity and that of his friends, aides and allies, speaking often of their television appearances, promoting their books and noting his closeness to them to promote both brands. The differences between Bush, the patrician dedicated to public service, civility and international cooperation, and Trump are endless. But, at the root of it all, Trump finds darkness in people, while Bush saw points of light.